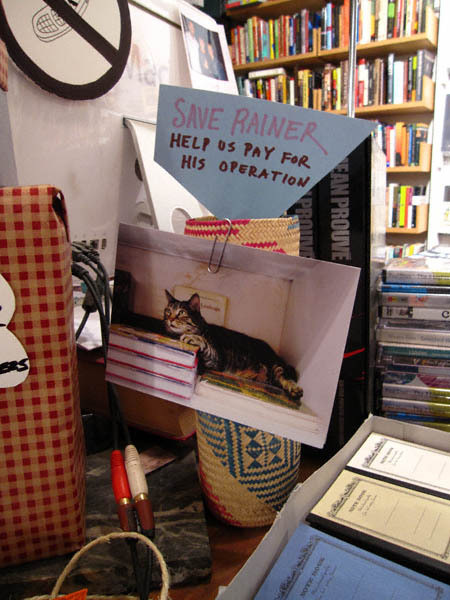 Tonight I was very despondent to learn that Rainer (one half of the feline dynamic duo at Spoonbill & Sugartown Booksellers) is experiencing health woes! Per the gentleman I spoke with this evening a cancerous tumor has been found on one of his shoulders. He is scheduled to have surgery next week and may very well end up losing a leg. If you have the time and money to spare please swing by, make a donation and give Rainer and his family your best wishes.